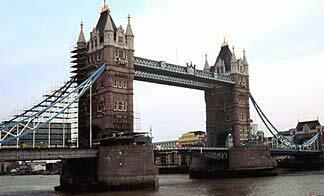 Constructed between 1886-94, Tower Bridge is one of London’s most recognized sights. It is the first of London’s Thames bridges and the only one which can allow the passage of shipping underneath. The bridge was engineered to be a two-level span: the lower level, a draw bridge which elevates to permit tall river traffic and the upper level, twin walkways for pedestrians. The electrical mechanisms for raising the lower bridge and the stairways for accessing the pedestrian walk are both contained within the massive towers. The observation area in the north tower permits superb views of the City of London and the surrounding Docklands. The Tower Bridge Museum in the south tower contains the original steam-driven machinery that was used to raise the bridge. There is no place in London, or, for that matter, in all of Britain with a more sinister reputation for brutality and savagery than the Tower of London. In its 900 years of history, it has been awash in the blood of kings and queens, rogues and innocents, alike. Constructed shortly after the Norman Conquest by William the Conqueror as part of the pacification effort of his newly won lands, the fortress consisted, in those days, of the central White Tower and surrounding walls, which incorporated part of the city wall originally built by the Romans. The Tower, as we see it today, didn’t take final shape until the reign of Edward I, who, like his immediate predecessor, added additional walls and towers to the original construction. The Tower of London has never been successfully attacked and its massive, forbidding aspect has served for centuries as a symbol of the power of the monarchy, to citizens and enemies, alike. Today, the Tower is the home of the Crown Jewels and a museum of arms and armor, second to none.